The fine art of celebrating Champagne - In Napoleon?s time, cavalry officers would crack off the neck of the bottles with a blow from their sabre to celebrate a victory. To continue with this centuries-old tradition, Claude Dozorme, designed this luxury champagne sabre. 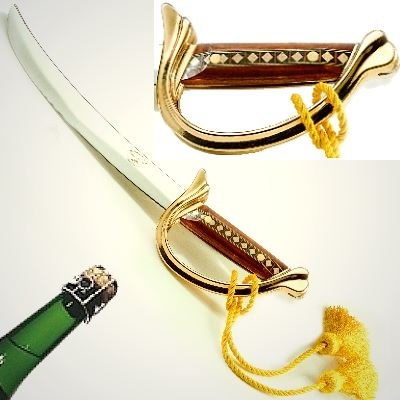 The Kellerman champagne sabre has 22 karat fine gilded hilt, a precious inlay wood handle, a 30 cm long blade and decorative dragoon tassels recalling the way cavalry officers held their weapon at the wrist. To present this exclusive sabre in an adequate way the sabre comes in an oak wood cassette including a booklet on "l?Art de sabrer le Champagne". - Laguiole Champagne Sabre Kellerman in oak wood presentation cassette, hilt 22 carat gilded, handle with wood inlays, yellow dragoon tassels, blade length 30 cm.